An action-packed DVD featuring all the excitement from this weekend's massive Apex Extreme event will be available to take away straight after the competition. For the past four years, our team of professional video journalists have compiled a stunning film featuring all the action and drama from the weekend. 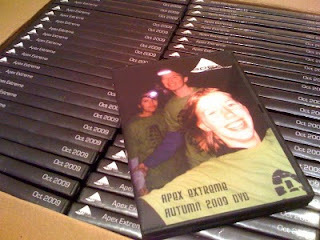 Now, new technology means these DVDs will be copied, packaged and available to buy at the event itself. Combining stunning footage from the activities, together with clips and interviews from those taking part, these films are perfect for sharing your memories of the event with others. Immediately show your family what you've been up to, share the experience with your friends, and keep it for years to come as a permanent reminder of your time at the Apex Challenge. For just £6, the souvenir DVD, which will feature every person at the event, can be purchased, complete with a bespoke box. Orders will be taken at Event Centre throughout the weekend, with the DVDs being available immediately after the results presentation. An incredible way to remember your incredible weekend!